Wow, since I blogged last I chose Python/Django and we rocked the gamification world with it. Lots of stuff I should have been chronicling. Trying to get back to it…but there’s a single event that prompted the return, I’ll be posting shortly on that. I’ve been learning the basics of these programming languages and development platforms lately. I’m impressed with the huge Rails movement, and Django seems like a very cool project. Both platforms allow web sites to be built at an incredible pace. Both Ruby and Python appear to be relatively straightforward. But I must say that at this still-early stage in my learning, Python wins for simplicity and ease. Ruby’s “code blocks” are a bit obtuse, as example reasoning. From what I currently understand about Rails and Django, their strengths lie in auto-generated code whether the implementation be application-supporting code derived from database schema (Rails) or database schema derived from application code (Django). Microsoft’s LINQ, which we’ve been using a bit at work, is similar but not foundational to the platform. It’s all cool stuff that makes DBAs anxious, which is always fun. After trying to test out Google’s AdWords client API using their supplied code samples, finding that those code samples require old libraries that the latest Python release doesn’t support, and realizing that Django itself won’t support the latest version of Python (3.0) for a year or more to come, I’m wondering what it would be like to have a wonderfully supported and rich platform like Rails tooled with a simple and evolved language like Python. Now I’m wondering what I’m going to have for dinner. I’ll probably get more mileage out of this wonderment. A number of years ago I was employed as an audio technician, and had the wonderful opportunity to travel around the country, recording people say interesting things. Out of all the events that I got to attend, TED was my absolute favorite. I’d come home boiling over with inspiration and enthusiasm for technology. If you aren’t familiar with it, check out some of the video that they’ve graciously made available for free. I just watched a very cool clip with Pattie Maes and Pranav Mistry about MIT’s “Sixth Sense”. I repaired an Onkyo DV-CP702 DVD changer today. 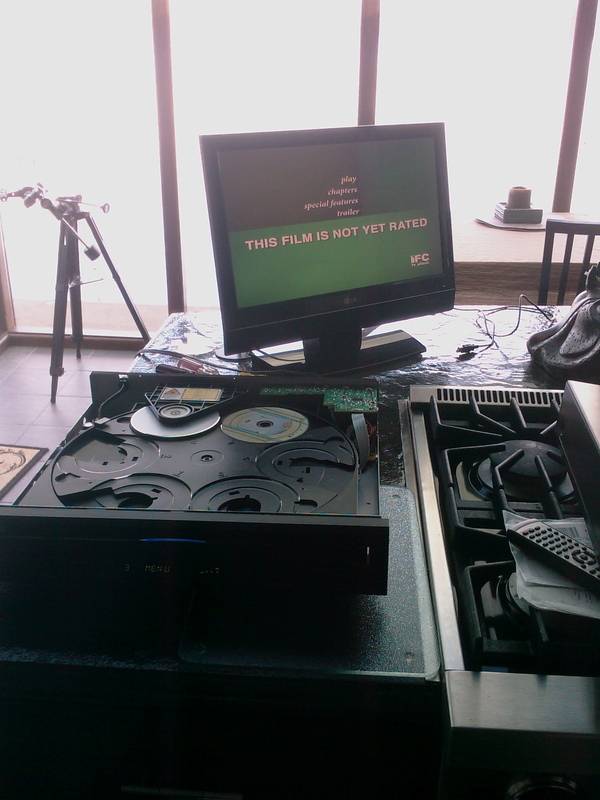 Below is a picture of it with the case still open, playing “This Film Is Not Yet Rated”. The DVD player had stopped working months ago. You could hear it loading discs, but nothing would play. First, I unplugged it. This was a key step. Then I removed the outer panel by unscrewing the six Phillips machine screws and tilting it up from the rear. Then I sat in wonderment for a good fifteen minutes, gazing at the complex beauty inside. Gears, motors, circuit boards, a fuse that hadn’t blown, a dead spider. What to do next? It wasn’t very interesting without electricity flowing through it. I noticed that there was a plastic shield covering what appeared to be the most interesting bits. It had a big yellow warning sign on it that said something to the effect of “Watch out, there’s a laser in here. Don’t look into it.” Miffed that the innards of this remarkable piece of equipment were causing me to read, I removed the shield. Again, I detected no movement, nor anything of any interest happening whatsoever. So, of course I plugged it in. Still nothing. A few things happened at that point: it went through a boot-up process, and then the carousel turned, trying to load disks. The carousel is a round plastic disc that holds the six DVDs or CDs. It turned one time for each slot, stopping to allow the disc-reading mechanism to pop upwards and cradle a loaded disc. I had put one in there, and when it got to my disc the disc-reader popped up under it, elevating it slightly. I heard the mechanism that moves the laser engage, and then…nothing. So I stared at it for a while. Why no workie? Finally it struck me – the disc is supposed to spin. Why disc no spin? Hmm. Time to take more apart. Unplug. Unscrew disc-loading mechanism, unplug electrical leads. Look at mechanism more closely. I noticed there were two motors: one for moving the laser back and forth, and another for turning the loaded disc. The disc-turning motor had two small screws holding it in the chassis, and two wires coming off of it. The spindle was crowned with the smaller disc that the DVD sits upon, and after looking without success for a tension screw, realized it had to be leveraged off by force with two screwdrivers. I then unscrewed the motor and clipped the wires where they connected to the circuit board. Then I figured I better get an electrical parts manual, to find out what part number I needed to replace. Ten dollars later, I had found the repair manual for the DVD changer on-line and had identified the part number needed, but didn’t have a lead on where to find one. I later realized that it would be easier and cheaper to read the part number right off the motor itself. Brilliant. I Googled the part number, and found Mat Electronics, an on-line distributor who had one in stock. Motor: $4. Shipping: $7. I ordered it. Then I went on vacation for two weeks. When I got back from vacation, I had completely forgotten where I was in the process, and couldn’t find any evidence (including a delivered motor) that I had ordered it. After looking at the cost, and realizing that I’d have to buy a new soldering iron to finish the job, I decided it wasn’t worth my time. It was going to likely cost me $50 bucks to fix a $200 DVD changer using a motor that was listed as a “high failure” part. Screw it. A week later the part arrived, much to my confusion. Time to go pick up a soldering iron at Fry’s: $6. So I brought the soldering iron home and got to work. I screwed the motor back into the chassis, and soldered the two wires back onto the circuit board. I then pressed the seat back on the spindle, pushing it all the way down. I replaced the chassis and dreaded tiny spring, and used my soldering iron to re-glue the spring to the chassis. Then I screwed the shield back on. Excited to see my work in action, I plugged it in and loaded a disc. Disc no spin. Nothing. Bummer. Oh well, it was a fun little project. Fail fast and early to save time, cost and headache. Nope – I couldn’t let it go. I stared at it for a while. Then I removed the shield and put a piece of tape over the laser to protect myself from my own morbid curiosity. Load another disc. Disc no spin. Closer look. Spindle seat was pressing against the laser housing! Oh my goodness, that can’t be good. I had pressed the spindle seat too far down on the motor spindle. Dang me, blast it. So I pried it off the spindle a bit and tried again. Nothing. Time to grasp at straws. The manual shows how to reset the micro-controller, so I did that. Still nothing. Closer look – the spindle seat was still pushed pretty far down. Pry it off a bit more. Then – it happened. After plugging it back in, the disc spun! I brought it out of the shop and into the nice warm house where I plugged the video out into a TV. The disc spun, but was making a strange noise. Not like “whirrrrr”, but more like “brrrrrrgrrrrwhrrrrrbraaaa”. The player readout said “No Play”, which typically means a dirty disc. I’m sure you can imagine the problem, given that description. The spindle seat was still pushed too far down, and the disc was moving vertically up and down too much. Unplug, dismantle, adjust spindle seat again. Clean laser lens, just in case. Reassemble, plug back in and…voila! Taking the photo above was the next thing I did after jumping up and down a few times and crying out like a schoolgirl. The total cost without the manual was actually under $20, and I spent a good three or four hours taking things apart, driving for parts, and reassembling them. I make a comfortable living in the software business, and my time is very valuable to me. Was all this time, effort and money spent to fix a $200 outdated and prone-to-fail-again electrical component worth it? Hell yes. Why not just buy a new one, or have someone else fix it (outsource it)? Because it was fun. Well, I’ve spent the last few days in Westport WA. This picture pretty much sums up the simplicity, happiness, and speed at which I’ve enjoyed being with my family here on the coast. This is an amazing animal. Beautiful calcium carbonate shell, with little tentacles eyes and olfactory organs perched, retractable … and yes, he slimed me. They will combine in the future to become PressMyFace.